George and Rosalie (Jardot) Voisinet immigrated to the United States from France in 1852. They are my husband's 5x great-grandparents through his paternal grandmother's (Naomi Grilliot's) line. They made the journey from their hometown of Évette, France with their children Marie Therese, Louis, Anthony, Louise, François Joseph ('Frances'), and François Charles ('Charles'). The eldest daughter, Marie-Celestine had already immigrated to America in 1847 with her husband, Pierre Burtcher and baby daughter, Marie Rose Julie (husband's 3x great-grandmother). Their eldest son, Joseph, later came to America with his wife and children in 1865. All of the family members initially settled in Loramie Twp, Shelby County, Ohio, near the small French-immigrant settlement of Russia (still pronounced "roo-shee"). 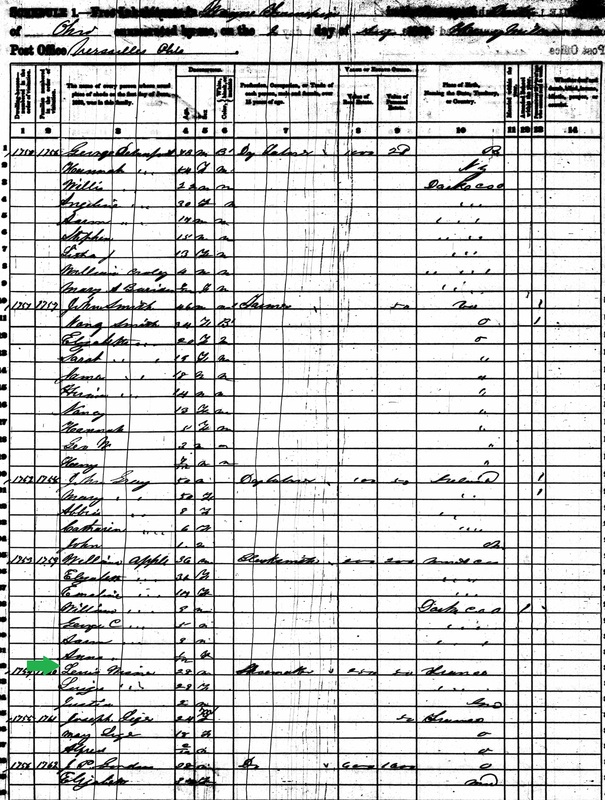 In the 1860 Census, the family is listed with the surname 'Weisinger.' I'm willing to bet that this difference was due to language barrier issues between the census-taker and the family - not uncommon in this area, especially with the mix of German and French immigrants who settled around here. The family lives on a farm. Only four of the children who came over with their parents remain at home; Marie Therese married in 1854, and Louis is living with his wife and child in the nearby town of Versailles. Louise, Frances, and Charles are still attending school. Unfortunately, this is the only U.S. Census in which George Voisinet appears. He passes away in 1866 at the age of 63. Rosalie lives until 1875.